The Walking Dead: March to War is an excellent strategy game developed by Disruptor Beam. The game lets you build a base, search and recruit survivors, eliminate zombies, raid player bases and solve survivor problems. You will be rewarded with resources, council covers, speedups, community relocations, cease fires and many other goodies after completing story-based missions and quests. March to War’s quests is split between main quest and individual council quests. You can play each unlocked character’s story at the council chambers to unlock secrets and get rewards for completing missions and objectives. 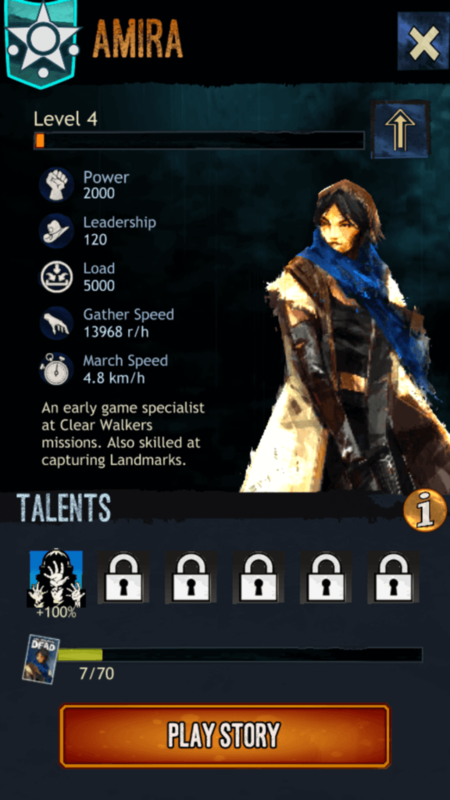 A Council member has better stats than survivors, and above all, leadership skills. Whether you want to attack rival human players, scavenge for food and resources or clear walkers, you will need to select a council member first before building a robust survival squad. 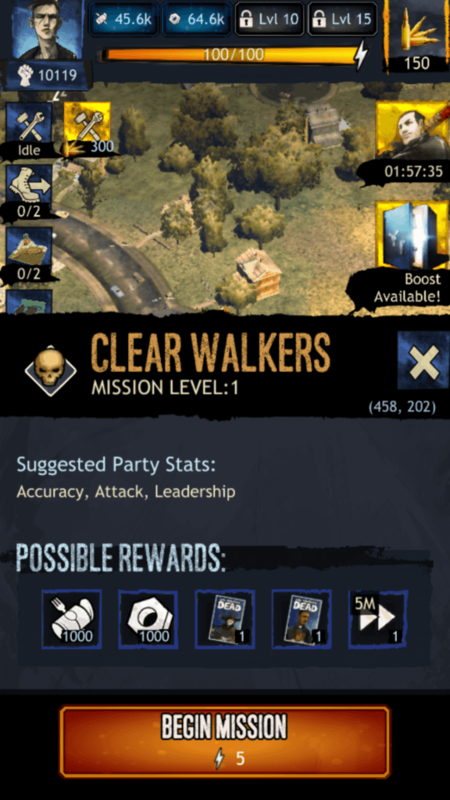 Complete “Clear Walkers” missions to get rewards, which include covers of your favorite TWD characters. On the world map, tap the skull icon and then tap the “Begin Mission” button to send a raiding party. Complete objectives of a council story to get covers, which can be extra covers for the same council member. Send raiding party to supply run missions. Tap the crate icon on the world map to start a mission. Clear Walker Swarm. Tap the big zombie hand icon on your world map and then press the “View Swarm” button to start a rally. You will receive better rewards if you eliminate lots of zombies. (More on Clearing Swarms in the next section). 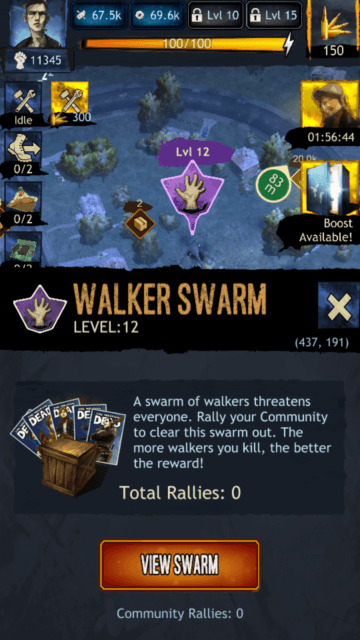 Walker swarms provide a big opportunity for community members to get better rewards, such as the much-needed council covers. You can rally your community to clear walker swarms, but before that you will have to join one. After a community accepts you as their member, search for walker swarms on your map. A swarm is denoted by a zombie hand icon and has a purple background color. If you see a swarm icon, tap it and then tap the” Start Rally” button. Next, select council member and survivors and then tap the “Send Raid” button. When you send a raiding party to the walker swarm, its co-ordinates are messaged to your community, thus encouraging other members to take part in this raid. A community member has to tap the callout button shown on the lower-left corner of the screen and then tap your message to join the rally. The more members join the rally, the more walkers will be killed. Each member’s contribution will be rewarded, which means that you and your team members may win covers and other rewards. To get better rewards, make sure more walkers are killed by your team and your community members’ teams. Your survivors will be injured after completing a walker mission or raiding a player. Don’t ignore any injured players and treat them at the Infirmary. Build and then tap the infirmary to “Heal” a survivor. A survivors HP is restored to max after healing is completed. Make sure you heal your survivors at the infirmary before they are critically injured. Survivors that have a “Critical” label beneath their profile pic can’t be added to your team, upgraded or healed. And in case someone attacks your base, then your most injured survivors will die first. Death is permanent and if that particular character is crucial for your team, then you can’t bring him/her back if they die. 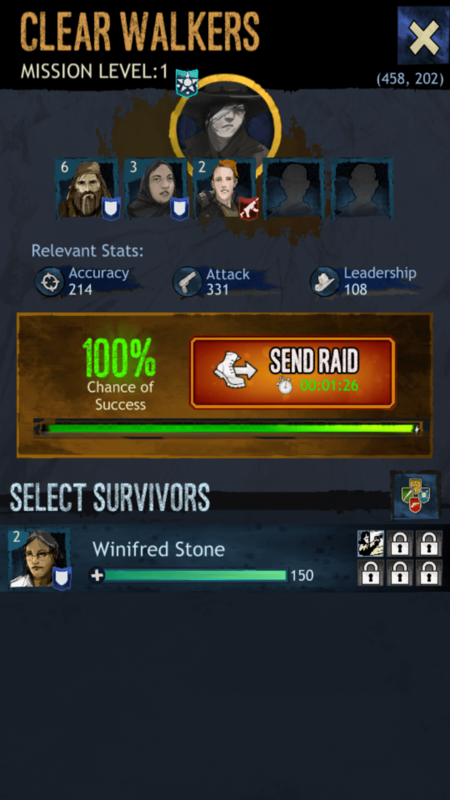 To know which survivor is critically injured, just tap “Survivor Barracks” > “Manage Survivors” and check the label underneath each character’s profile pic. The warehouse stores lumber, food, salvage and fuel pallets. Upgrading it will increase total amount of protected resources. You can upgrade it to level 30. Leveling up also increases the number of food, salvage and fuel pallets. Survivor Barracks lets you control and manage recruited units. Upgrading barracks will not only increase the number of survivors you can recruit, but also increase the max survivor level. Example: At level 2, the number of survivors it can accommodate is 7 and the maximum survivor level is 4. Upgrading it to level 3 will increase the survivor count by 1 (8) and increase each survivor’s max level by 2 (6). So at barracks level 2, your survivor level will be maxed out at 4 and you will need to upgrade your barracks to lift that max level cap. Council Chambers lets you manage council. Here you can access each member’s story and play them to unlock more objectives, missions and rewards. Just like survivors, council members can also be leveled up at the Range. However, to increase the max level cap of each council, you will have to upgrade the council chambers. You can’t level up a maxed level council until you have upgraded chambers. To know the max level after each upgrade, tap the chambers and then tap the “I” (info) icon. The Broadcast tower lets you search for new survivors. You can recruit a survivor or trade him/her for supplies. I would recommend recruiting survivors, especially those that have a rare skill. To get higher-level characters, tap the tower and press “upgrade”. Upgrading the broadcast tower will not only let you search for better survivors, but also expand your searches. At level 10, you can search regionally, which will let you recruit better units than those that you get while searching locally. Many times, you won’t be able to upgrade a structure as you would need to upgrade your HQs first. But that’s not all; upgrading Headquarters also provides additional benefits. Leveling it up will increase your base fortification strength. Remember that if your fortifications reach zero, you will be randomly relocated to another location. Your fortifications decrease when other players attack your base. You can repair it once every 30 minutes, but you should still consider improving your fortifications. At certain levels, your HQ will also unlock extra empty plots for you so that you can build more structures. The best part of upgrading HQ is that it will increase the number of deployed raiding parties. At level 2, you will be able to deploy 2 raiding parties, whereas at level 9, you can send 3 parties simultaneously. Keep upgrading the HQ to get these extra benefits. The possible rewards for completing “Clear Walkers” missions are food, salvage and council covers. If you are on a council cover collecting spree, then you should complete these missions. However, clearing zombies will be impossible if the success chances are low. You must try to get at least 80-100 percent win chance if you want to clear zombies comfortably. And this can be only possible if you choose that right survivors whose stats match the “Suggested Party Stats”. You can see suggested stats when you tap mission icon (skull). Example: If a mission’s suggested stats are “Accuracy, Attack and Leadership” then you must choose those survivors that possess one of these skills. Your council possesses leadership skills, so you can select a council with the highest leadership stats. This will fill the success bar a bit. Now choosing those survivors with high “Accuracy” and “Attack” stats will fill the success rate a bit more. Try to select survivors that have the highest stats among all to increase the success rate. Before selecting survivors for clearing walkers, check their stats. Just go to Survivor Barracks > Manage Survivors and then tap a character’s profile pic. Now let’s come back to increasing success rate. To increase success rate, you will have to improve survivor stats. This is possible if you train your survivors/council at the Range. Training them will increase their stats. Make sure you improve stats of those characters whose skills match with those suggested in a mission. You can solve survivor dilemmas and while it may not affect the overall outcome of the game, you surely will get rewarded handsomely for making the right choice. You will be given two options and selecting an option which you think will be a perfect solution for a survivor’s problem will earn you better rewards. 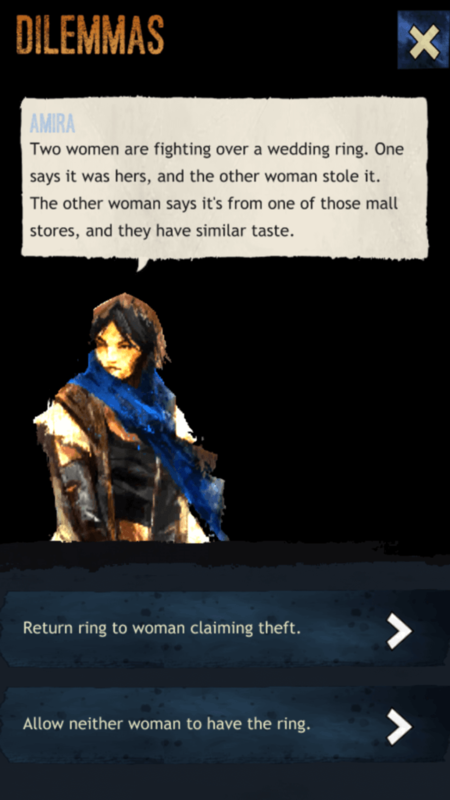 To get access to Survivor Dilemmas, tap the exclamation mark at the bottom of the screen and then tap the scale icon. Now read the problem and select any one choice you think would solve it. Dilemmas can be pretty fun to solve and can be very tricky sometimes. But choosing the best solution will definitely earn you a council cover.